Washington (CNN) -- Even as Libyan rebels struggle to gain control of the country, some U.S. lawmakers are demanding the United States punish the rebel leadership unless they turn over the Lockerbie bomber. Sen. Chuck Schumer, D-New York, on Wednesday called on the State Department to condition further assistance to the rebel National Transitional Council, including access to frozen Libyan assets, upon the return to prison of Abdelbeset Ali Mohmed al Megrahi. Schumer made the demand in a letter to Secretary of State Hillary Clinton as she prepared to leave for Paris to attend an international conference to discuss ways to help the Libyan opposition. "If the new Libyan government continues to shield this convicted terrorist from justice, then they should not get one more cent of support from the United States," Schumer wrote. "We put American lives and money on the line to help the Libyan people secure their freedom. It's time the Libyan government lives up to its commitment to create a free and accountable society by handing over al Megrahi so that justice can finally be done." On Tuesday, Sen. Robert Menendez, D-New Jersey, urged Clinton to demand access to al Megrahi so he could be questioned. "Given that we have been told before that Megrahi was near death when he actually was not," Menendez wrote, "I urge you to call on the (NTC) to allow American and international officials access to Megrahi immediately in order to conduct an independent assessment of his health status." Last week, Republican presidential candidate and former Massachusetts Gov. Mitt Romney called on the "new government" to arrest and extradite al Megrahi "so justice can finally be done." Al Megrahi was convicted in 2001 of the bombing of Pan Am Flight 103. All 259 people aboard and 11 people on the ground were killed when the Boeing 747, bound for New York from London, crashed in the town of Lockerbie, Scotland. Scotland's justice minister granted al Megrahi an early release in August 2009 after his attorneys and Scottish authorities said he was dying of cancer and only had three months to live. He received a hero's welcome in Tripoli, enraging many in the United States and Britain. And with the recent overthrow of longtime Libyan strongman Moammar Gadhafi, politicians on both sides of the Atlantic have called for al Megrahi to be sent back to prison. Earlier this week, CNN's Nic Robertson found al Megrahi under the care of his family in his palatial Tripoli villa. 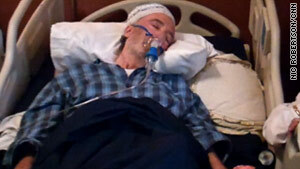 He was bedridden, comatose, and surviving on oxygen and an intravenous drip.